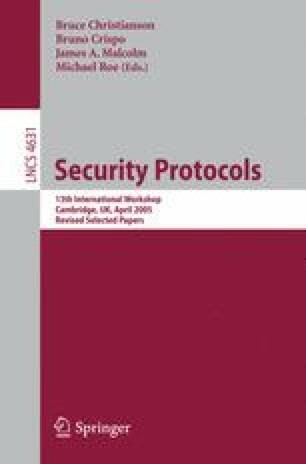 Ben Laurie: So these protocols only work if you actually try and connect devices to each other? Reply: Because of this type of auxiliary channel, yes, they would need to be next to each other. Bruce Christianson: If you want to be sure that the two things that you’re holding are connected to each other and not to some third party, yes? Reply: Yes. In the past, someone who can eavesdrop on this auxiliary channel will be able to break your system, so what we’re saying here is that with our protocol, they can eavesdrop all they like, but by the time they eavesdrop it’s too late. They have to break the hard problem, to calculate the right keys.